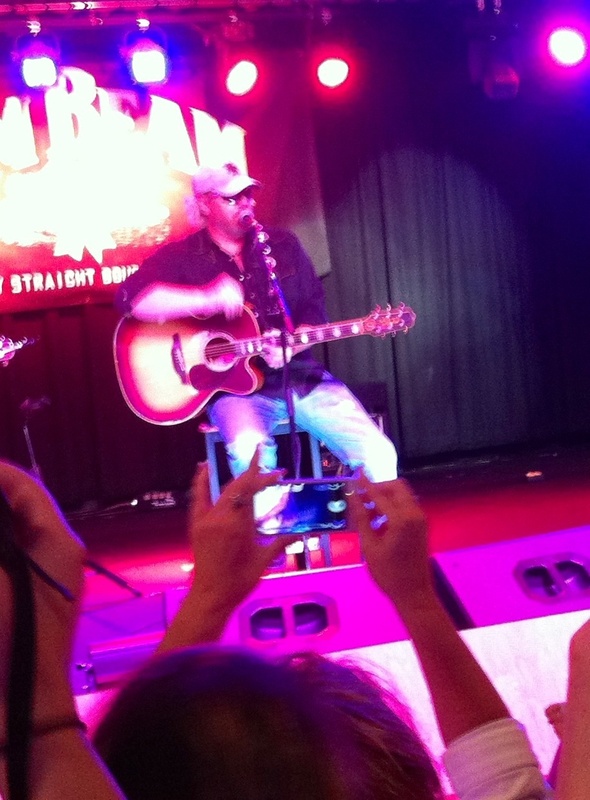 Toby Keith performs an acoustic song at His Bar. The beer and whiskey has been flowing, bologna frying, guitars twanging at Toby Keith’s I Love This Bar and Grill at Destiny USA in Syracuse since spring. The official opening was at 4 p.m. today, Aug. 23. The big man himself strode from the wings, accompanying guitarist in tow, to perform three songs at His Bar. Hundreds of people held phones aloft to capture the moment. Teens stood with little kids, parents, various adults, all thrilled to be on the upper level of the gigantic shopping mall on this special Friday afternoon. Call it a Very Happy Hour. “Hello, Syracuse,” the country music star thundered into his microphone as a welcome. He explained that now there about 20 TKILTBs sprinkled throughout the country. Fans waved as Toby Keith departed, off to the New York State Fair Grandstand, where he headlines before a larger crowd this evening.